The greatest movement of people seeking refuge in Europe since the second world war is taking place across the continent. The total numbers of people escaping war and poverty by seeking a new home in Europe will be in excess of 1 million people. The challenges these numbers present are manifold with the re-settlement of individuals and families a priority, alongside the need to ensure their longer-term inclusion into society. Fare believes that sport can play a role in helping to meet some of the challenges faced by new arrivals and ensure the safe integration of individuals into communities. Activists and volunteers across Europe have been involved in supporting refugees over recent months. One of the ways of doing so has been through the simple act of offering space and friendship to participate in football through grassroots clubs to help newcomers integrate. Fare has created a database of grassroots organisations, teams and football clubs that are actively welcoming refugees or organising training sessions and other initiatives to help refugees find a place. The database aims to give migrants and activists the opportunity to find out about teams near where they live and how they can get involved. The list is not comprehensive. If you know about a team or club that works with refugees, or if you want to set up a group or team, please get in touch by sending an email to info@farenet.org. SKV Altenmarkt Frauen is a women’s football team and they organise activities for asylum seekers and refugees living in Austria. Often they invite refugees to football matches and provide training session for young refugee girls. Keep up with updates on the Facebook page. The asylum camp Erdberg is a temporary home to roughly 500 people. About 270 are underage children between 14 and 18, who have arrived without their parents or other legal guardians. The organisations Connect.Erdberg and Connect.Traiskirchen aim to offer to these children a new perspective with the help of free activities. They host workshops and sport sessions, in which the teenagers get to know more about the new country they now live in and which helps them to connect to the local community. Initiatives and NGOs, like Goodball, Microsoccer and FairPlay are supporters of the programme. Vienna-based club Dynamo Donau have started an initiative to welcome refugees to join their training sessions. The club is currently looking for female players to join their women’s team. Trainings take place every Wednesday at 18:00. For more information click here. FairPlay set up a database of Austrian initiatives and organisations that welcome refugees in their clubs and teams. The list is updated on a regular basis and people can contact FairPlay for more information or if they want to add something. Send an email. The educational organisation PROSA (Projekt Schule für Alle – Project School for All) gives refugees over the age of 15, who by Austrian law don’t have the right to attend school in the country, the opportunity to pursue their education. A recently formed football team enables teachers, volunteers and refugees to get to know each other and to socialise on a more informal level. Everybody is invited to the training sessions. FC Sans Papiers die Bunte was founded in 2005 and strives to provide refugees and asylum seekers in Vienna with a platform in which they can play football and meet others from different backgrounds. Austrian Bundesliga team FK Austria Vienna organises weekly football training sessions for refugees in co-operation with the initiative Connect.Erdberg at the club’s academy. Flucht nach Vorn is a club working together with accompanied and unaccompanied under age refugees. The institution offers sports, arts, culture, music and education to promote a peaceful, respectful contact with one another without any prejudices or discrimination. The club organises weekly training sessions in many sports, e.g. football, skating, basketball, volleyball and jogging. The activities are open for all. More information about the project and ways how to participate can be found on the organisation’s homepage. Children and teenagers between six and fourteen years are invited to participate in weekly free football training sessions and tournaments hosted by youngCaritas Cage League. The trainings take place in parks in Vienna. Times and venues can be found here. The Vienna-based project offers football training sessions for youth refugees and amateur players. Over 40 boys and girls currently take part in the group’s sessions. They are looking for coaches and players to join the project. Contact them through their website. Twentyone FC has opened its training sessions for refugees to contribute to recent supportive actions for refugees in Austria. Teenaged and adult refugees are invited to participate in the sessions on Thursdays between 8 and 10 pm in the club’s ground at Erdbrustgasse 4-18, 1160 Wien. The club provides sports clothes for the participants and will host events in the near future. For more information, contact David Hudelist via email or 017133594-72 beforehand. The club provides support to ten young refugees and asylum seekers from the Fedasil centre in Morlanwelz. AS Morlanwelz also offers a flexible membership option to people from the centre where those who wish to become paying members can choose to make weekly or monthly payments. 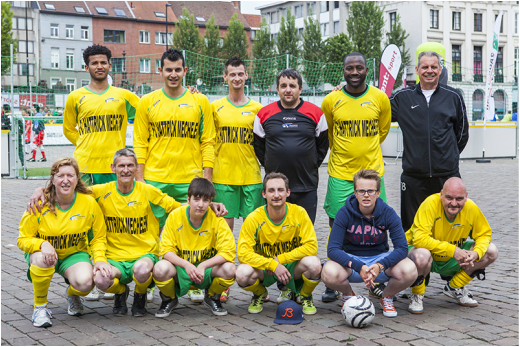 BX Brussels supports the homeless competition for people in Brussels, the BXLR Cup, in which teams are mainly constituted of asylum seekers. BX Brussels offers free meals, training sessions, club card member and facilitates internships opportunities. The Belgian FA are developing a new project called ‘Tous sur le terrain’ (Everyone on the field) to help professional and amateur clubs better integrate refugees in the country. The project consists in creating informative material for clubs about the procedures to register refugees players, organising events to share good practices amongst clubs, developing an informative toolkit. The FA is playing a supportive role in ensuring clubs reach their goals and objectives by organising meetings and info sessions about refugees with clubs and local refugee shelters. Also the project addresses the need to involve volunteers to help in the social integration of refugees through the clubs’ activities. First division club, Club Brugge, has opened its solidarity team to refugees. The club not only provides training sessions, but training material, meals but also assistance to find a job or a home. CS Biergeois works closely with the Rixensart and Bierges reception centres to provide young refugees and asylum seekers with opportunities to playing football and also provides support where necessary to allow those who wish, to become a coach or assistant coach. Daring Maria-Aalter run training sessions for refugee children and has in the past donated training materials for the refugee children. Women’s club FC Molenbeek initiated a training project for refugee girls, which from next year’s onwards will be integrated in the club’s youth department. FC Hattrick is a football team from Mechelen, formed in 2010. The club offers football sessions for refugees and uses football to included the newly arrived into the local community. Based in Genk, the club has been working with the Lanaken and Houthalen-Helchteren reception centres to provide refugees and asylum seekers the opportunity to play football in every age category. KFAC Waarschoot not only welcomes refugees and asylum seekers who wish to play football, they also work closely with the Eeklo Red Cross Welcome Centre to offer volunteering opportunities at the club. Kraainem-based amateur club Kraainem FC offers football trainings and language courses for refugees on a weekly basis. Over 300 children and teenagers from 42 countries benefit from the club’s activities. Kraainem FC also helps collect football material for newly arrived refugees. In Grembergen, East Flanders, KSK Grembergen is hosting training sessions for 50 refugee children, which will be integrated in the club’s youth team over the next season. The club has also donated training and football material to the children. Oud Heverlee Leuven has two initiatives in place that promote refugee and asylum seeker inclusion. Through “Youth OHL-Worldteam” the club provides training for young people aged between 13 and 18 years old every Wednesday afternoon. Running alongside this project is the “Worldteam OHL” initiative that is currently made up of more than 30 players who train every Tuesday and Thursday. Pirate City is a social football project that operates across several locations in Antwerp. The project looks to promote the integration of refugees and asylum seekers with members of the local community through football and other activities such as CV workshops and cooking classes. A list of training schedules for both male and female teams can be found on the club’s website. The club from Aywallie regularly organises events aimed at promoting refugee and asylum seeker inclusion. Young people from the Sedoz Red Cross Centre can attend training sessions for free. RFC Liege fans, staff and partners initiated a goods collection initiative ‘A Warm Heart’ for refugee centres, including clothes and bicycles. R.F.C. Syriana is a football team based in Antwerp and is made up of refugees from around the world, they have 53 members and two teams. The club has two projects dedicated to promote the inclusion of refugees. The first is name ‘I can!’ and helps a group of 15 asylum seekers to find jobs through the values of football, while the second is named ‘Rap on stap’ is a initiative that decreases club membership fees for refugees. 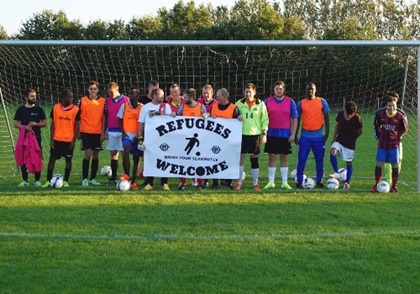 Belgium 4th division club SVV Damme hold training sessions for asylum seekers in Sijsele. In its commitment to being a club for all, US Pesche from Couvin has welcomed refugees and asylum seekers into its training sessions and several senior and youth teams. Six players from the local reception centre are currently playing at the club. 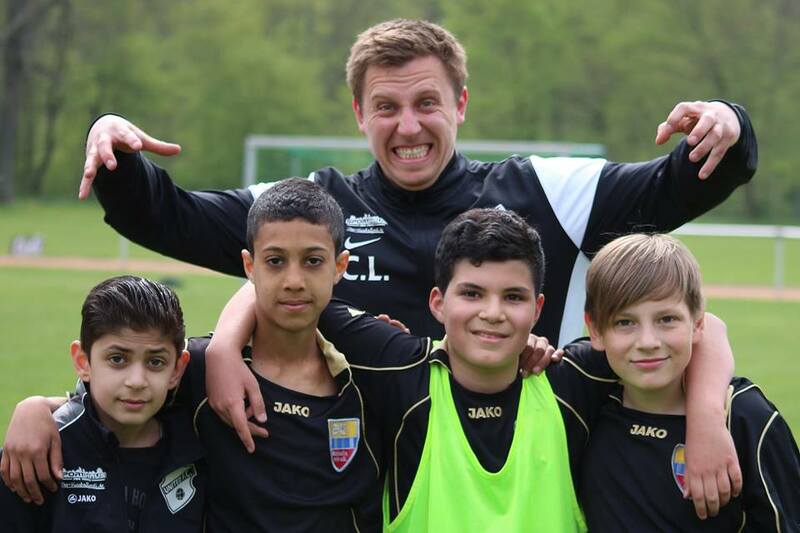 Grassroots club Velm VV longstanding commitment to welcome refugees has fostered new talent in its youth academy. VK Langemark-Poelkapelle organises two monthly training sessions for up to 20 young refugees and asylum seekers. The sessions are held every first and third Wednesday of the month from 19h to 20.30h. Tang Ra Futsal Sofia was born after the refugees team ‘Team of Hope’. At Tang Ra players have the chance to compete in sport events and benefit from social activities after the training sessions. Team of Hope is an amateur sports team made up of disadvantaged people, Roma and refugees living in Bulgaria. 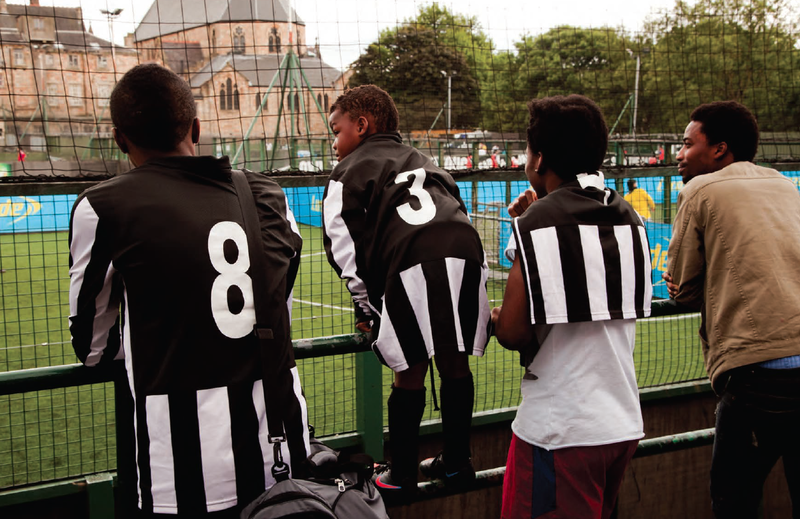 The team’s football programme is designed to combat social exclusion. NK Zagreb 041 is a newly founded club that aims to integrate everyone via direct democracy and to fight all forms of discrimination. The club was set up by the Ultras Bijeli anđeli from Zagreb who recently left their club NK Zagreb in protest over mismanagement and corruption. They have founded their own football club together with migrants and refugees. A number of refugees have joined the club and are either supporting the team or are playing in the first squad. The new club is actively cherishing the powerful idea of social activism and is committed to the idea that the fan association as well as every individual, can make a contribution to the fight against hate, violence, discrimination, racism, fascism, homophobia etc. for which there is no place in football. Movement for Equality, Support and Anti-Racism (KISA) teamed up with Omonia Nicosia to offer 150 tickets to disadvantaged citizens, migrants and refugees to attend matches during the 2017/2018 season. 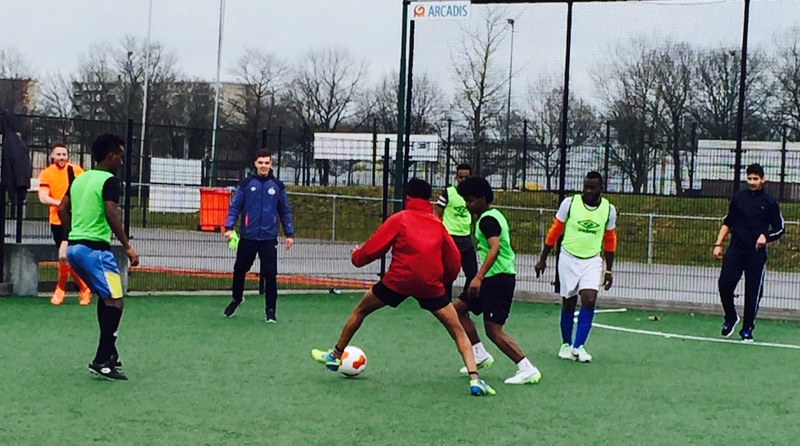 Grassroots ACFC offers football opportunities for youth migrants and ethnic minorities in Aarhus. Asylliga, in English Asylum League, is a project of the Danish Football Union, Red Cross and Tryg Foundation aimed at facilitating refugee integration through competition. It is first edition, planed to kick-off on 5 August 2016, refugees centres in western Zealand, Avnstrup , Dianalund, Kalundborg and Korsor will be participating. Danish professional club Brøndby IF have continuously promoted initiatives to help refugees in Denmark. The club hosts free football trainings sessions for 104 Syrian refugees and has in several times encouraged fans to donate used football gear, including clothes, balls and toys to help refugees in their everyday life. Every Tuesday, Espergærde IF brings together refugees living in the city to foster their integration through football. The Fyn regional FA and a number of Langeland clubs have partnered-up to offer sporting activities to the refugees and asylum seekers living in the island. The synergy is offering training sessions to over 90 unaccompanied minors with the aim to promote social integration and sharing Danish culture. The football club Holbæk B&I.Samarbejdet has partnered up with Holbæk city council and Zealand’s regional FA to involve sports and physical activities in the daily routines of refugees living in the city. In Sommersted, Denmark, volunteers run football sessions to over 20 residents of the local refugee centre. For more information about the activities go to http://www.kfum-kfuk.dk. With the support of the Zealand Football Association, Køge Boldklub is running two weekly football sessions for refugees as a means to keep them activity and engaged in social activities. Red Cross and Nivå Kokkedal football club is helping refugees in the Sandholm Centre to provide weekly training sessions to a group of 20 young refugees. The sessions are bound to take place every Friday. After 200 Syrian refugees have been housed in apartments near the club’s ground, activists started offering them football clothes and balls and the opportunity to attend training sessions and football matches. Between 40 and 50 asylum seekers from Syria, Iraq, Iran, Afghanistan and Eritrea are now training every Monday and Thursday at the Rødby Boldklub ground. The new players play alongside the club’s men’s team to better promote social integration. UC Syd are offering two training sessions per week to children newly arrived in Kolding. The coaches are themselves refugees and aim to help the children integrate while learning Danish. English Premier League club Arsenal FC have been working with the international charity Save the Children to help Syrian refugees since 2012. In 2013, after raising £120,00 at the annual Arsenal Foundation Ball for refugee aid projects, former Arsenal player and Arsenal Foundation ambassador Martin Keown visited the Za’atari refugee camp, in Jordan, where he inaugurated a new football pitch built in collaboration with the charity. Over the last three years the club lead several fundraising initiatives, including an annual match day in which player’s donate a day’s wages, looking to build friendly spaces in response to the Syria crisis. In Iraq, Arsenal are currently building two pitches in refugee camps to which the club has donated Arsenal kits. More recently, at the Premier League match against Stoke City (10 September) and the UEFA Champions League match against Olympiacos (29 September), £1 and €1 respectively, were donated to refugee-aid organisations. The club is also a supporter of the initiative Freedom From Torture, which brings together survivors of torture who have sought asylum in the UK for football training and English language workshops. In Barnsley, South Yorkshire, an amateur team is providing football training sessions for refugees and asylum seekers living in the city along with English language lessons at the Red Cross and library for conversations. The initiative, which started in May 2015, also promotes social gatherings after matches. AFC Bournemouth are inviting two teams to join the weekly Sunday Kicks sessions at the Vitality Stadium. The club is supporting a new initiative that aim is to set up two teams of 6 players each to help integrate young refugees and asylum seekers in the local community. This new initiative that is set to start in March is a collaborative work between a student-led charity, Student Action for Refugees Bournemouth (STAR), Bournemouth Council for Voluntary Service and refugee charity International Care Network (ICN) to provide weekly training sessions that focus on promoting social integration and wellbeing. The weekly training sessions and league matches will be every Tuesday evening on Bournemouth University‘s very own pitches. Through the Fit 4 All initiative, the Burton Street Foundation provides free gym session for asylum seekers on Wednesdays from 13:00 until 16:00 in Victoria Hall. The club runs free football sessions every Thursday from 8pm to 9pm at the Abbey Leisure Complex in Cambridge. 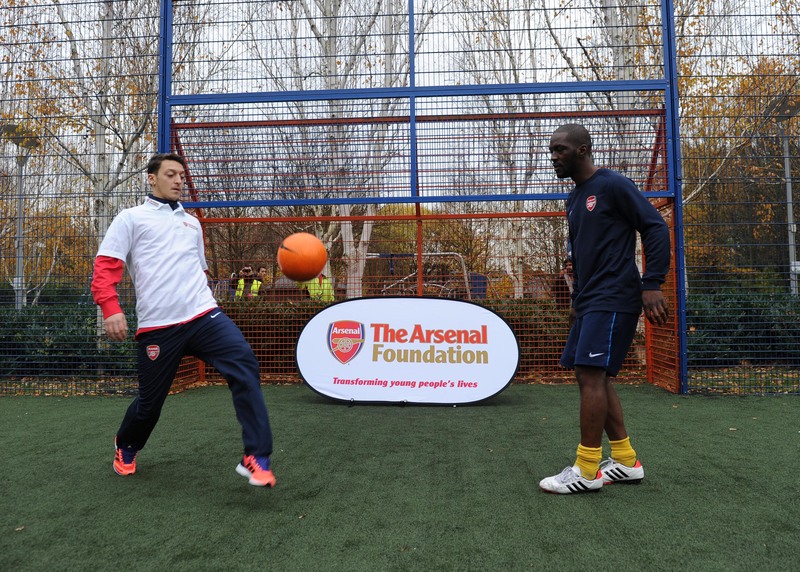 The sessions were organised as part of the English FA’s Football For All programme. Sporting organisation Easton Cowboys & Cowgirls is running training sessions for refugees over 18, using the sport and the club’s social activities to promote social inclusion. Based in Easton, near Bristol, the club offers sessions for men and women, the men’s training sessions take place on Wednesday nights from 7.10pm – 8.30pm; while the women’s team trainings are on Mondays and Wednesdays. On Monday’s the sessions run outdoors from 8.30pm – 9.30pm and on Wednesdays indoors from 7pm – 8.30pm. Refugees and asylum seekers can freely join the team but registration is required. Please contact Tash Ferguson on 07837 810032 or Susannah Mallaghan on 07890 410143 to register your interest. For the men’s football sessions, please contact Jesse Tate on 07722 997378 or Iain Shewan on 07549352726. Premier League club Everton runs weekly football sessions for refugees through its social arm Everton in the Community. FC Kolektivo Victoria are a football club based at Victoria Park, Leicester. The club recognises the fundamental equality of all people, irrespective of age, class, culture, disability, gender, ethnicity, religion, or sexuality. The club welcomes all people, regardless of ability, who want to be part of a club, which promotes mutual respect, sport and having as much fun as possible. Football Beyond Borders uses the power of football to tackle inequality and provide opportunities for young people to achieve their goals and make their voices heard. The organisation believes that football is the most powerful tool in the world for inspiring young people to achieve their goals and make their voices heard. The participation in the club is open to all young people regardless of their background. The aim is to make everybody feel valued, confident and empowered to become active citizens and achieve. Football Unites, Racism Divides (FURD) is a community group founded by Sheffield United supporters in 1995. It tackles racism and discriminatory abuse in football and society. In reaction to the recent refugees crisis the group has welcomed people fleeing from war and persecution in their homes and said: #refugeeswelcome. The group sent a humanitarian mini-bus to the Hungarian boarder to support arriving refugees with food and other supply materials. Weekly kick-about sessions with refugees from the local camp in Sheffield are offered in the “U-Mix Centre”. The group is supporting the Stadia of Sanctuary campaign, which seeks to encourage professional football clubs to welcome refugees through a more formally organised and sustainable programme. FURD have also launched a season long programme named Football Supporting Refugees encouraging fans in Sheffield to engage with refugees and asylum seekers living in the city by attending matches together on a regular basis. For more information about the group’s work with refugees and asylum-seekers, see the organisation’s homepage or mail Chris Stone. Football Welcomes kicked-off in 2017 as a weekend of activities supported by a range of Premier League clubs, the English Football League and the FA Women’s Super League, to mark the 80th anniversary of the arrival in the UK of some of the first refugees to play professional football in the country. Clubs participating in Football Welcomes put on various activities and events to show their support for and solidarity with refugees. The campaign is supposed to became an annual event. The Tigers Trust has created a football team to help refugees settle into their new life, keep fit and make new friends. The team is called Kicks International and plays in the colours of Hull City FC to ensure players feel part of the club and community. The Trust also has a number of free football sessions for young people aged between 8 and 19. For more information check out about training times and the other free sports sessions offered click here. Learn for Life run free football session every Tuesday at 15:00 at the Learn for life centre, 241-243 London Road, Sheffield, S2 4NF. Gent in touch via email info@learnforlifeenterprise or by phone 01142559080. Leicester City of Sanctuary football project is an initiative that helps asylum seekers practice sport. They run football sessions at local sport venues every Saturday morning from 10:00 until 11:30. This project has the full support and collaboration of Leicester City Football Club that provides two youth coaches to deliver skills training sessions and organise games. Football tournaments are being planned for the future, however the project continues to involve refugees and asylum seekers in playing friendly games around the city. Men City, a project set-up in Hull to provide an inclusive, safe space for people to play football which focuses on creating social opportunities for individuals through football. Men City is also use to promote further areas, more specifically to target the inclusion of refugees in a manner that could create further opportunities for them. Men City takes place every Monday, Tuesday, Wednesday and Saturday and typically every session attracts 20 to 40 people. Find out more about where and when it takes place here. MFC Foundation along with the Methodist Asylum Project (MAP) have launched the ‘Club Together’ programme aimed at refugees and asylum seekers in the local area. Each week the group meet up at our Herlingshaw Centre in South Bank (Middlesbrough) and take part in both a classroom based English lesson, followed by a football session. Notts County Football in the Community, which runs weekly football sessions for refugees and asylum seekers, will be inviting first-team players Alan Smith and Shola Ameobi to visit the project. Notts County Football in the Community (FITC) in partnership with the British Red Cross and Nottingham Refugee Forum, aim at integrating refugees and asylum seekers into British life by providing them with free weekly football sessions, to allow them to keep fit, make friends and feel part of the local community in order to reduce social isolation. Barnsley FC Reds in the Community have set up a weekly football session to support refugees and asylum seekers play football in a safe environment. The group of 18 play every Tuesday at Oakwell, which involves a coaching session from our community coach followed by a match. Refugee Football consists of weekly free football sessions for refugee men over 18 in Nottingham. The sessions take place every Thursday at 5pm at the John Carroll Leisure Centre. Manchester-based charity Revive is offering football, gym and cycling sessions for refugees. 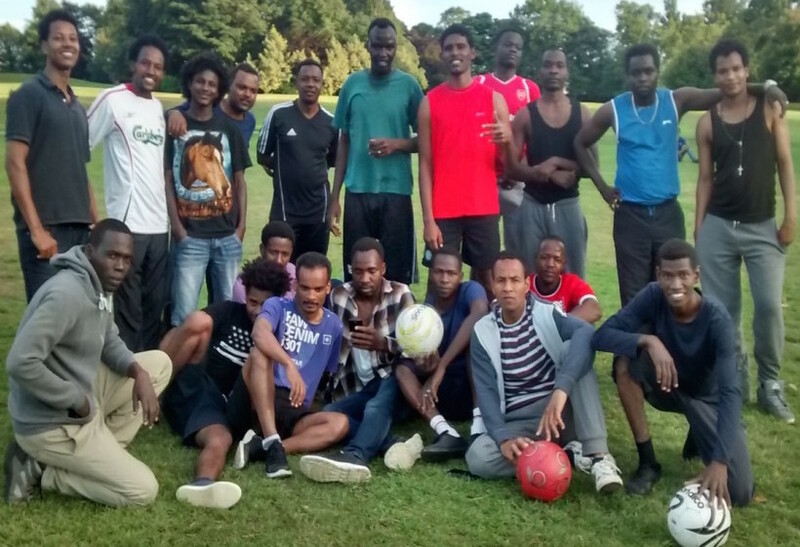 Their football team, Revive Refugee FC, meets every Thursday afternoon for a kick-about. The Salford Sports Villages offered the team a free 2-hour pass per week to use the astroturf pitch. Play2Remember is an annual five a side tournament that takes place in London and is made up of players who have fled war torn countries. The tournament was created by the charities Waging Peace, Football for Hope and Peace & Unity to encourage reconciliation through sport. Sport led charity Plymouth Hope promotes community cohesion and inclusion through several projects including its football project Plymouth Hope FC targeted at refugees and asylum seekers. Every year Plymouth Hope organise and run an annual football festival that brings together over 1500 people and has currently a team playing in a local league (16+). Sir Tom Finney Preston Soccer Centre provides free football coaching for approximately 25 adult refugees and asylum seekers. A football project, set up by Sporting Equals, targeted at refugees in Bradford sees the West Riding County FA deliver football sessions for refugees and as a result has seen many individual become active and increase their confidence. Swindon United was created by Broadgreen-based Harbour project to help integrate refugee men 18-45 years old into the community. The team’s coach, Albano Abrantes is a former Barcelona Football Club’s Florida football school coach and they team train every weekend at St Joseph’s Catholic College in Swindon. 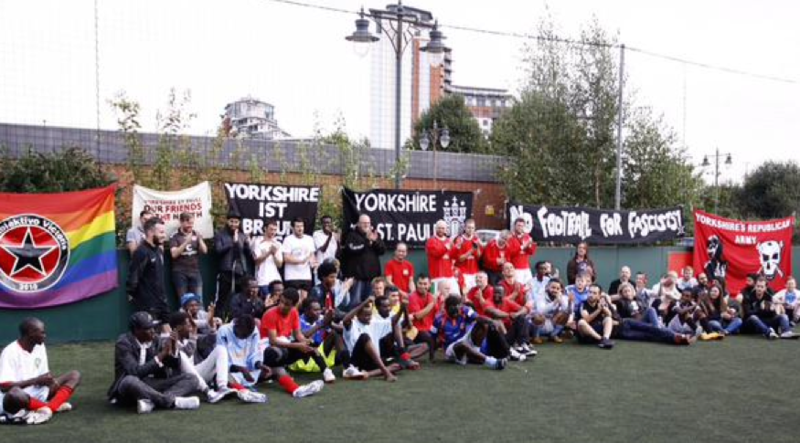 Yorkshire St Pauli has launched a Football for All project seeking to connect with refugees and asylum seekers and helping them to get access to football. At the moment 20-30 people participate in weekly sessions. Espoo sports and youth department and Helsinki Human Rights have launched a sports initiative for refugees twice a week, these include futsal and basketball sessions in the Kannusilta gym and Lagstads school. Mondial Stars Ry provides sports opportunities for everybody and offers open football sessions. Informal community group Kallio ‘Meet the Neighbours‘, in Kallio, runs weekly football sessions for refugees, asylum seekers and Finns. The sessions take place twice a week. The Parisian LGBT-friendly club has opened their training sessions to refugees. Female and male refugees are welcomed to join their training sessions at the Maryse Hilsz stadium every Wednesday at 7.30pm for women and 8.30pm for men. The club can offer equipment for newcomers. To find out more email fcparisarcenciel@gmail.com. FC Lourdais XI continues to help integrate many refugees majority of them coming from Afghanistan, by providing training sessions, support and other social activities. The club is assisting the Reception Center for Asylum Seekers (CADA) in Lourdes, which was created in 2016 as part of the French national system for the reception of migrants. The club not only helps with the various social activities but also have signed up refugee players to train with the club. French organisation l’Armée du Salut, in Strasbourg, runs weekly trainings sessions for refugees at risk of exclusion. Les Dégommeuses are a football team and an association that combats discrimination in and through sports. During their activities the group regularly gathers approximately 80 people, players and activists. The football team is mainly made up of lesbian women. Transpeople and heterosexual women are warmly welcomed as well. 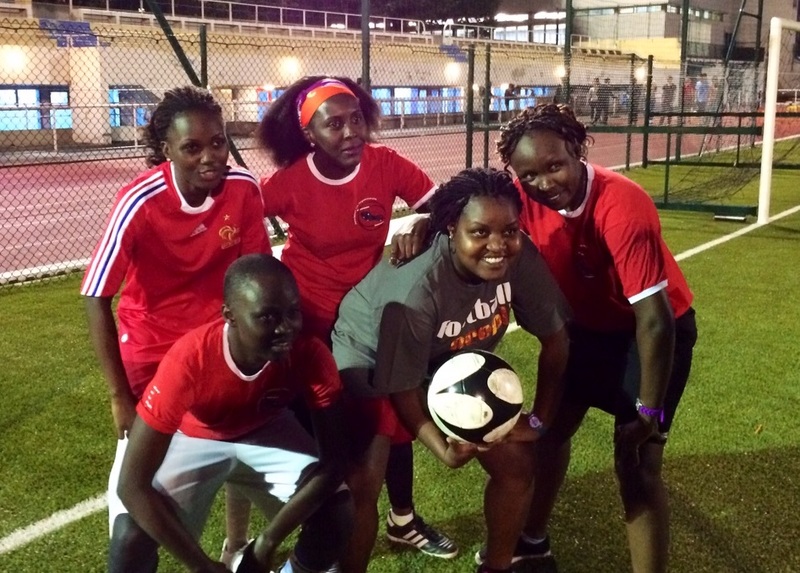 Thanks to pro-active action and through links to Les Lesbiennes dépassent les frontières and ARDHIS, two organisations that support LGBT refugees fleeing from homophobic regimes, several women refugees are taking part in the club’s sports activities. This program is sponsored by “Fondation de France”, namely for the purchase of sport equipment. All activities are based on the idea that sport is a powerful tool for individual and collective empowerment, provided that it stays as much inclusive as possible. Melting Passes is a football club based in Paris and since 2016 has provided young refugees and asylum seekers the opportunity to train regularly and play in a league ran by the FSGT (Fédération Sportive et Gymnique du Travail — Labour’s Sporting and Gymnastic Federation). The club has approximately thirty-five players who take part every week. Panamboyz United is a gay friendly soccer club in Paris with two teams. The club’s fight is not limited to the fight against homophobia. Embracing diversity and working towards greater respect and tolerance on the field is the team’s ultimate goal. The club fights against all forms of discrimination, e.g. racism, sexism, anti-Semitism. Refugees and migrants are welcome at Panamboyz. Send an email. Founded in 2002, the NGO provides support for refugees through a range of activities, which include emergency health assistance, accommodation and sport. Sport Dans La Ville is a national organisation with sports facilities located in the heart of disadvantaged communities across France. There are many sports on offer including: football, basketball and tennis for young girls and boys from the age of 6 to 22. Sports sessions are held every Wednesday and Saturday. More information about the sports sessions taking place across France can be found here. 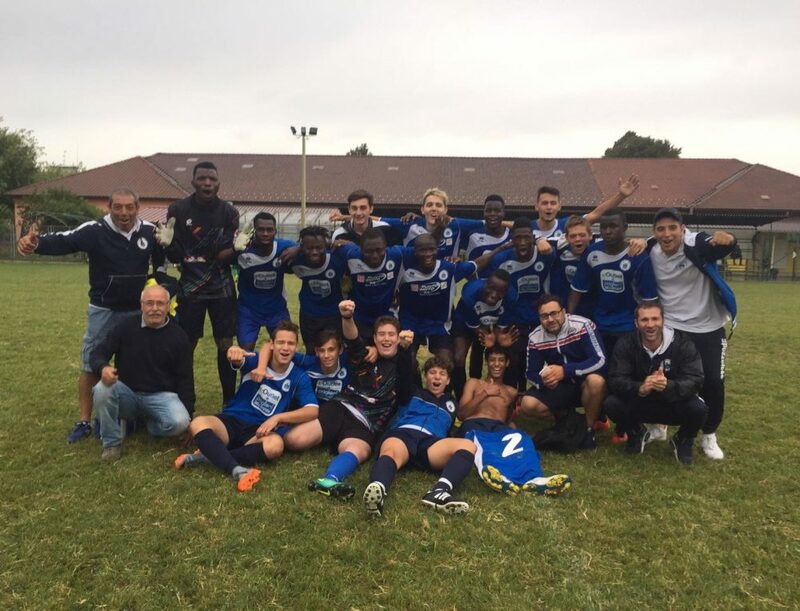 15 refugees from the Emergency Accommodation Centre (CHU) in Mézy-sur-Seine (northwest of Paris) took part in a match with local football club U.S. Hardricourt, organised by NGO Voisins Solidaires. The match was organised and played to tackle the stereotypes about refugees and to integrate them in the area. The club is now creating opportunities for refugees to play regularly and attend home matches. Close to the Dutch border in Aachen the Aachener Förderverein Integration durch Sport (Integration through sport club) offers football activities for girls from migrant an refugee backgrounds. As part of the ‘Welcome to Football’ Leverkusen has created a project called ‘Bayer 04 does school’, which aims to help refugee children take the steps to join a club in the local areas. This club was founded in 2016 by former Arminia Bielefeld players Karsten Bremke, Uwe Fuchs and Benjamin Lense to help the integration of refugees and disadvantage children through the project ‘Integration through Sport’, which is supported by University of Bielefeld and the Stadtsportbund Bielefeld. With the support from Detlef Kemena and Manfred Steinert, two other former Bielefeld players, they also offer German lessons in addition to training sessions. The Bundesliga Foundation, supported by the German government and a childrens foundation, initiated a unique nationwide programme “Willkommen im Fußball” (Welcome to football) that helps create “welcome alliances” between professional and amateur clubs and civil society organisations. They offer young refugees up to the age of 27 a wide range of activities from football training to language courses, help with fining internships and social activities with the local youth. Currently there are ten alliances up and running across Germany. Find out about the programme and the locations here. In Burscheid the football club Burscheider Ballverein invites refugees for regular training sessions. The club’s work has been widely promoted through the media. Borrusia Dortmund has started a new program as part of the nationwide programme ‘Welcome to Football’, to engage young refugees aged between 16 and 20 and help them integrate in the local society. In collaboration with local football club TSC Eintracht Dortmund and BVB fans, free training sessions are provided on a weekly basis at TSC’s stadium. The initiative also includes German courses and interactive evening events organised schwatzgelb.de. Champions ohne Grenzen (Champions without Borders) aims to propel social inclusion and participation of refugees in Berlin and the German federal state Brandenburg. The organisation offers football sessions and provides advice, networking and social events for refugees from all over the world in German society to give everyone the feeling to be at a new home. CHoG offers football for men, women and children. Check out their YouTube channel, which has explanatory videos for refugees: ‘How can I join a football club’, the video is available in German, English, Farsi and Arabic. “1:0 für ein Willkomen” (1:0 for a welcome) is an innovative initiative launched by the German FA DFB in the first half of 2015. The programme focuses on providing support for and building capacity of amateur and grassroots clubs through a dedicated seed-funding and information programme. Clubs can apply for up to 500 EUR to kick-start a local project, found teams or offer trainings for refugees. The money can be used for staff, training equipment; membership fees or other essentials that help refugees get into the game. Since the launch of the programme over 800 clubs have benefited. The DFB also provides support through a good practice guide that seeks to answer the most frequently asked questions that trainers and club officials might have in relation to working with migrants and refugees. The document can be downloaded here. The participating clubs can be reached via the regional FAs that can be contacted here. The third team of DJK Teutonia Ehrenfeld play in the amateur division in Bochum and integrates refugees from the local refugees camp. The team was recently awarded a prize by the German Green party for their social engagement. Send an email. The Foundation supports the Braunschweig Children and Youth centres by organising football sessions once per month . The ESV Neuaubing Sports United is the first refugee football team playing in the German federal state of Bavaria. The players are between 18 and 23 years old come from a number of countries and have very different backgrounds. They are united by the sport they love – football. FANport Münster offers weekly sessions members of the community to engage in dialogue about fan culture and address the issue of discrimination. Refugees are regularly invited to attend the sessions on Mondays and Wednesdays to engage with other local young people. The club also organises tournaments and cultural events during their football matches when refugees attend. FC Ente Bagdad is an amateur club founded in 1973 notorious for its integrative work through football. In 2015, the club partnered-up with the Bundesliga club 1. FSV Mainz 05 and Juvenile Foundation to welcome young refugees and help them integrate in Germany as part of the German Football Association project “Willkommen im Fussball”. Since then, FC Ente Bagdad has integrated around 50 refugees in its teams. 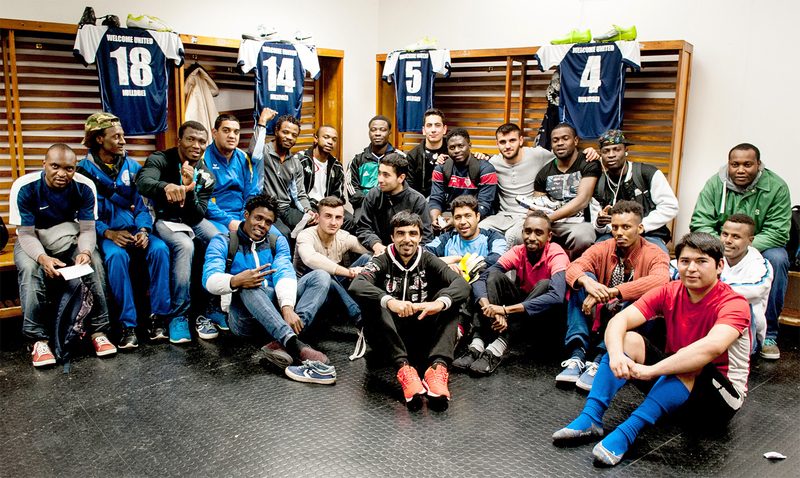 The FC Hamburger Berg has welcomes more than 60 refugees into the club’s squads. Besides sharing the pitch, the club’s activists try to provide medical, legal or linguistic support , as well as sports clothes for the new club members. Get in touch and send an email. FC Inter based in Lindlar is a football team that was created by local sport club TuS Lindlar to support the integration of refugees in Lindlar. Members of the refugee team have been enrolled in the youth teams of TuS Lindlar. The team consisting of up to 25 players meet every Friday for training sessions in the Volksbank Park Stadium or in the Vossbruchhalle. TuS Lindlar has recently been recognised by local district sports association for their work on integration through sport. FC Lampedusa Hamburg is a team founded by players from the Lampedusa Refugee Group in Hamburg. Most of the players are West African migrants, who fled from violence and war across the Mediterranean Sea to the Italian island Lampedusa and then made their way to Germany. 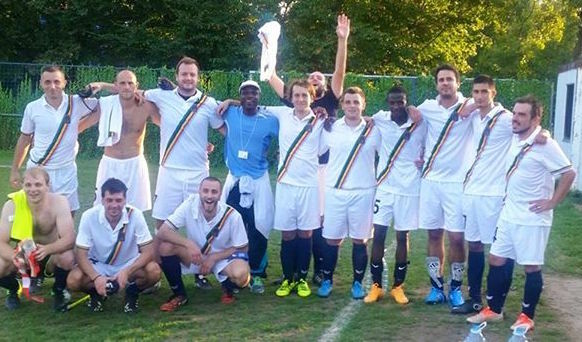 FC Lampedusa Hamburg plays friendlies and participated in tournaments and aims to raise awareness of the flaws of European refugee policy and the situation of refugees in Hamburg, in Germany and in the wider European community. The FC Lampedusa Hamburg welcomes all refugees and migrants over the age of 16, regardless of their nationality, ethnicity, religion, sexual orientation, other identities and abilities. Send an email. FC Lobberich-Dyck and Refugee Aid Nettetal have joined forces to organise the first international tournament called the ‘United Nette Cup’ that counted with the participation of 70 players. The tournament was organised as means of intervention to address the lack of activities and engagement of young people in their provisional accommodation centre in Kaldenkirchen. The tournament will now run for the next few years thanks to the collaborative work between FC Lobberich-Dyck, Refugee Aid Nettetal and city’s social welfare office. The tournament is part of ‘Flüchtlingshilfe Nettetal’ programme that also offers vocational education and the opportunity for refugees to learn German. 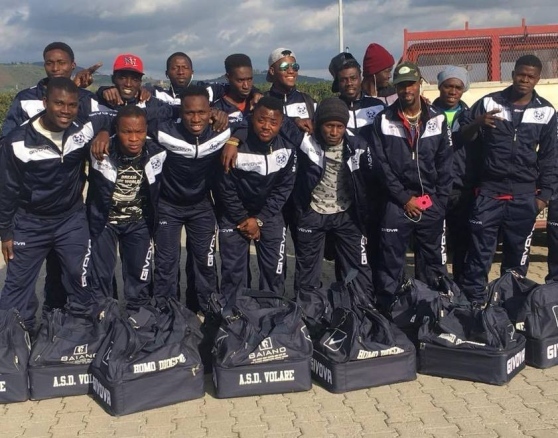 Currently FC Lobberich-Dyck has 15 refugee players who have been active in the club’s sport programmes and through that they have been able to interact with locals and be involved in the community. There are other clubs who have been involved in the integration of refugees in the local regions such as, BSV Leuterheide, TSV Kaldenkirchen, VfL Willich and KSG Oh-Do-Kwan Dülken. In 2000 the club was successfully founded and has every since been the home for many refugees and people with foreign backgrounds. The club has integrated many players; currently they have 15 players within the club and are looking for new members, players and fans to join and support the club. FC New Citizens is a Duisburg-based refugee team that has been organising regular training sessions since November 2015. The 13 men team is constituted of Afghan refugees, aged between 14 and 27, who play football together twice a week. Supported by local amateur clubs TSV Geiselbullach, SV Esting and SC Olching, the newly founded FC Refugees, located in Olching near Munich welcomes young players to train and socialise together. Journalist Constatin Stüve formed in 2014 a team of refugees to promote their inclusion in Germany and give his contribute to the refugee cause. Based in Berlin, the team currently plays in the third league of the capital and trains every Wednesdays. FC Vatan has been recognised for their exemplary and active work integrating refugees in the local community in Königslutter. The club is supported by the Egidius Braun Foundation of the German Football Association (DFB) and is awarded €500 for the provision of sport equipment to help run activities. Follow the club’s Facebook page for regular updates. Since December 2015 FSV Frankfurt Fanprojekt initiative has been bringing together football supporters and refugees. Weekly training sessions are run enabling cultural exchanges, common experiences and integration. In Safe Hand e.V. offers refugee children between the ages of 8 and 12 years old to play regular football every Thursday at FC Augsburg’s Junior Performance Centre. The football sessions are offered through the ‘Strangers Become Friends’ project and are available to boys and girls living in the local area. In Safe Hands also offers free homework support and language classes to those who attend the football sessions. More football sessions have been organised between In Safe Hands e.V. and another local club TSV Haunstetten that take place every Thursday from 16.00 to 17.30. Jugend Verbindet e.V. (“Youth Connects”) organises weekly football sessions for unaccompanied refugees and local teenagers in Bonn. The football sessions take place at the Altes Godesberger Stadion every Tuesday from 18.00 to 20.00. KICKFAIR is promoting the inclusion of child asylum seekers and refugees through workshops, street football, at two model schools in Baden-Württemberg. Kick’n’fun is an initiative that was created to get refugees and locals to play football together, to promote social inclusion and prevent violence and intolerance in the local town Radevormwald. This is a collaborative work between Stadt Sport Verband (SSV) and Reformierten Kirchengemeinde. The initiative is open to all aged between 16 and 24 years old and the first training is scheduled to take place at the sports hall Hermannstraße Sunday 28 January from 19:00 until 21:00. Leipzig United FC is an integrative football project of the Leipzig based charity organisation “NETZwerk „blau-gelb“ e. V.”. Children, teenagers and adults from ten different nations are playing in the team, many of them living in local reception centres. United is open to everyone, regardless of origin, social status or nationality. Send email. Best practice platform for refugee sport projects in North Rhine-Westphalia. Based in Hamburg, NestWerk e.V. has been working since 2014 in different projects focused on promoting refugee inclusion, such as swim classes for refugee youth and football sessions. Local sport clubs SV Eversburg, Ballsport eV Osnabrück-Eversburg and SV Atter have committed to support the integration of refugees in an agreement with the local sport association in Osnabrücker that sees many sport opportunities being created for the participation of refugees in city. They organise football tournament for refugees in camps and also social activities in and around Rothenburg, Zittau and Löbau (90 km east of Dresden). They work with local asylum seekers centres as their work continue to grow as more and more refugees join the activities being organised. Keep track of their activities via Facebook. RheinFlanke is a youth aid specialist that ensures the participation of young people in sport continues to grow. Through their project HOPE the organisation provides regular sports to refugees and practical help, including doctor’s visits, language classes, internships, amongst others. The project has established a football team, which now plays under the umbrella of Spielvereinigung Arminia 09 Koln eV in the Kreisliga D.
The club offers open training sessions for local refugees each Friday. North Germany club BW 94 Papenburg offers training opportunities for refugees with the view to integrate the best talents into their league teams. Four of the 25 regular training participants have already gained permission by the local FA to play in the third and second team of BW Papenburg. Training sessions are held on Tuesday 4-6pm and Friday 3-5 pm. The fan group Shalker Fanprojekt is offering weekly training sessions for young fans and refugees on an indoor sports centre in Gelsenkirchen. The initiative is supported by the youth ministry of Nordrhein-Westfalen and will also include visits to other teams and the attendance of matches. SC Riedberg is a sport club based in Frankfurt that offers sport activities in many sports such as, football, rugby, cricket, basketball and many others. They collaborate with Salesian missionaries, Don Bosco Youth Help Center and other organisations that support refugees to provide opportunities for young refugees, run several campaigns including ‘People like me’ to collect sport equipments for those that don’t have. The club welcomes refugees who want to be active in sport, find out more here. SG Lucklum-Veltheim II also known as The Panthers are a refugee team based in Veltheim who train every Tuesday and Thursday, playing in the Nordharzklasse Staffel 3. The village of Solingen, which in the beginning of 2016 welcomed 79 newly arrived refugees to the Henry-Dunant-Dorf refugee settlement, offers refugees and asylum seekers the opportunity to practice sport on a regular basis at the Bavert sport field. A partnership with the German Red Cross saw the charity donate 39 football boots to equip refugees and further their participation in football training sessions. In collaboration with Koordinierungsstelle Ehrenamt der Stadt Emden (the coordination office for voluntary work of the city of Emden) local football association in Emden created the project Sportpartnerschaften (Sport Partnerships) in order to help integrate refugees into the local community through sport. For further information on how to get involved click here. SV Azadi Lübeck is newly formed football team that was created by a group of friends to provide playing opportunities for refugees and bring people from different cultures together. The club currently plays in Kreisklasse C – SO1 an amateur league in Lübeck. They organise tournaments, provide German lessons for those with language difficulties and also organise family friendly events to help integrate other. Local club SV Issum based in Duisburg in 2016 created the SV Issum International to give refugees the opportunity to play, learn and be integrated in the community. The initiative started when the club organised German lesson classes for refugees in Duisburg with the help of a local teacher. The programme started with eight players in 2016 and now 20 players make up the SV Issum International team. ‘Kick for refugees’ is a programme developed to help with the integration of newly arrived refugees in Freiburg. More than 50 children and young people regularly take part in the weekly sports programme. Find out more here. Through the projects implemented by Landessportbundes Sachsen, sport club Witzschdorf provides services to help integrate refugees. The club has six teams that provide refugees opportunities to play. Other clubs involved in the project are: FC 1893 Altona, SV Rot-Weis Hutte and ‘Buntkicktgut’ Muchen. Local sport club TB Wülfrath is supporting the integration of refugees in an initiative started by local citizen Bettina Laue-Rieth, who works with refugees in different areas. The handball department provides the facilities for the weekly one hour session, when Bettina Laue-Rieth and the group of refugees meet to play football. The club offers mentoring and sport sessions for refugees and migrants. The third team of German grassroots team TSV Friedberg consists of refugees coming from Senegal and Syria and is open to everyone. During the 2016-17 season Vitesse-Mayence from Mainz participated in the ‘Welcome to Football’ campaign, the club offered regular training sessions for up to 40 young refugees. Half of those stayed at the club to play regularly to establish the Youth team A. The players train every Wednesday from 18.30 to 19.30 and Friday from 17.30 to 19.30. In Babelsberg, near the German capital Berlin, the supporters umbrella organisation Nordkurve Babelsberg of local club SV Babelsberg 03 have been active supporters of Welcome United Nulldrei since 2014. Werder Bremen’s initiative ‘Stay on the Ball‘ gives young refugees the opportunity to play football and be actively involved in the community. The club’s CSR brand ‘Werder Moves’ collaborates with local organisation Refugio to run weekly training sessions for young refugees, which includes girls, in four districts in Bremen. The ‘Fit Girls’ program is a sport and leisure project that allows refugee girls aged between 13 and 17 to to come together and play sports on a weekly basis on Fridays from 18:30 to 19:30 at the Werder-Halle Hemelinger Straße and football trainings on Tuesdays from 17:00 to 18:30 at the Weser stadium. In addition, young refugees are also involved in other educational and cultural activities, such as workshops, trips and video shoots. VfB Waldshut offers free trainings sessions every Monday. In November 2015 when the club opened its doors for the first time about 40 Syrian refugees took on the offer and kicked about with the club’s regulars. In the meantime some on the newly arrived made it through the ranks to the first team of VfB Waldshut. Lesbos-based Superleague club AEL Kalloni FC have launched an on-going campaign to help refugees in Greece. As part of the “Kalloni FC active in football and in society” project, the clubs is collecting clothes, blankets, sleeping bans, umbrellas, shoes and other materials that can help address the humanitarian crisis. The football club Moria Lesvos, based on the Greek island, founded a new football club called “Byron” dedicated to refugees living in the local refugees camp. Greek NGO Organisation Earth is using football to promote the social inclusion of young refugees living in the Skaramagas refugee camp, near Athens. 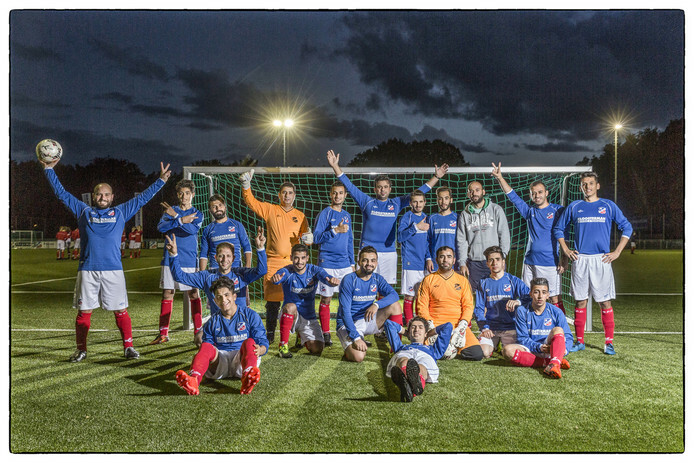 As part of the project, Hope Refugee United was formed and is set to start competing in a Greek championship as part of its goals to represent the refugee community in the wider Greek community and be part of it. The NGO also runs training sessions for refugee children in the camp. Kará Tepé United is a football project started by the Irish NGO Football For Refugees in the Greek island of Lesbos. During November and December 2016 more than 300 children benefited from the programme, which looks to run regular training sessions for boys and girls of Kará Tepé. Sessions take place twice a week. Thessaloniki-based professional club PAOK FC offer training sessions for refugee children to promote social inclusion. Human rights network Terre des Hommes is delivering regular football training sessions for youth living in the Derveni refugee camp (Thessaloniki). Inter is a Budapest-based football club that brings together refugees, mainly, from Nigeria, Cameron, Iraq, Iran and Libya living in the Hungarian capital. Inter CDF was originally set up to help footballers from Africa who struggled to be accepted by clubs. To support and promote the integration of immigrants, the Football Association of Iceland (KSÍ) launched the ‘Welcome to the football family’ programme through which they are informing parents on how their children can join a football club in Iceland and distributing football equipment to immigrant children and encourage them to attend training sessions at local clubs. In addition, refereeing courses in a language other than Icelandic will also be organised. A number of Syrian refugees began training with Ballaghaderreen Club youth team after a successful event (Roscommon versus Mayo fixture for Syrian refugees living locally) organised by the club. Limerick based club Ballinacurra Gaels has been recognised for their continuous commitment to promoting the integration of refugees and asylum-seekers in Ireland. The recognition comes after successfully completing their ‘Club Welcome’ programme developed by Show Racism the Red Card. Through ‘Club Welcome’ which is an initiative that aims to increase the participation of refugees and asylum-seekers in grassroots sports, Emo Celtic provides free access to the club’s facilities for residents of Montague House and gives free membership to the children of asylum-seekers. ‘Club Welcome’ is run by Show Racism the Red Card and will continue to support clubs throughout 2018 as ports clubs across Ireland are called upon to register their interest in participating. SARI is a non-profit organisation that uses sport as a means to promote social and cultural integration, global development and peace building in Ireland and abroad. The Soccernites/Hijabs & Hat-ticks are football and educational development programmes that offer free football sessions to children aged between 14 and 18 years old and a Young Leadership programme. The training sessions take place every Friday from 5pm – 7pm at Dublin Council’s multi-purpose pitches in Clontarf. For more information on SARI’s activities, please visit here. League of Ireland Premier Division club Sligo run weekly training sessions at the club’s astro pitch with up to 30 refugees and asylum seekers taking part each week. This programme is run in collaboration with anti-racism organisation Show Racism the Red Card who developed the ‘Club Welcome’ programme to help integrate refugees and asylum seekers across Ireland. Atletico Pop United is a football club that uses the game to promote social inclusion in Italy, including the inclusion of refugees and asylum seekers. The club often participates in the Fare backed festival Mondial Antirazzisti. Visit their Facebook and Twitter pages. ASD Balon Mundial, a Turin-based non-profit organisation that since 2012 has been using football to disseminate and promote good practices on inclusion and solidarity, is organising one of this year’s Football People action weeks main events. On a crucial moment for Europe and Italy in particular, the Fare member is organising a one-day international conference named ‘Cittadinanza Sportiva’ to address the institutional discrimination and exclusion asylum-seekers, refugees and immigrants are facing. Furthermore the organisation is supporting refugees and asylum seekers for years, gives juridical support and enables people to play football near the asylum-seeker-camps. 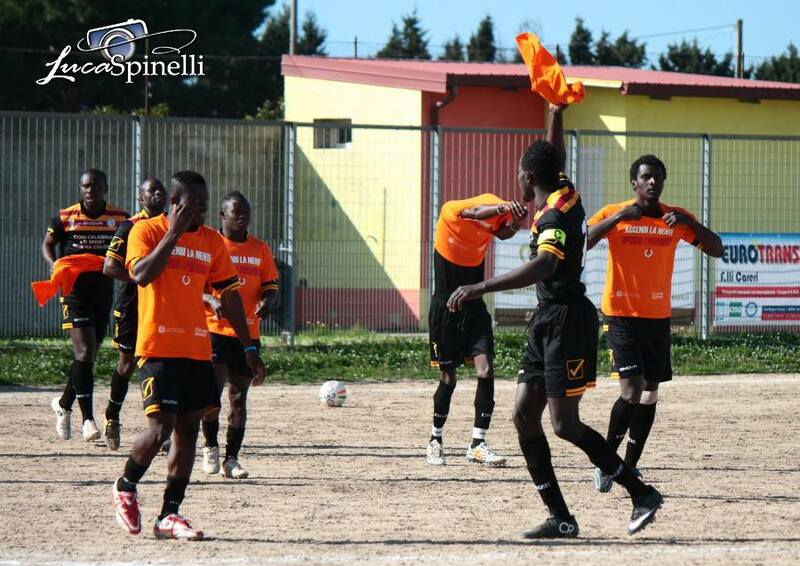 The amateur club from south Italy was founded by a local priest and is integrating immigrants and refugees from Africa in the football league. They use the unifying power of football to integrate the refugees in the local community and to enable the football loving men to participate in the sport they love. ASD Mineo is a 25-man amateur squad composed of African refugees, created and funded by the managers of the Mineo centre for asylum seekers. 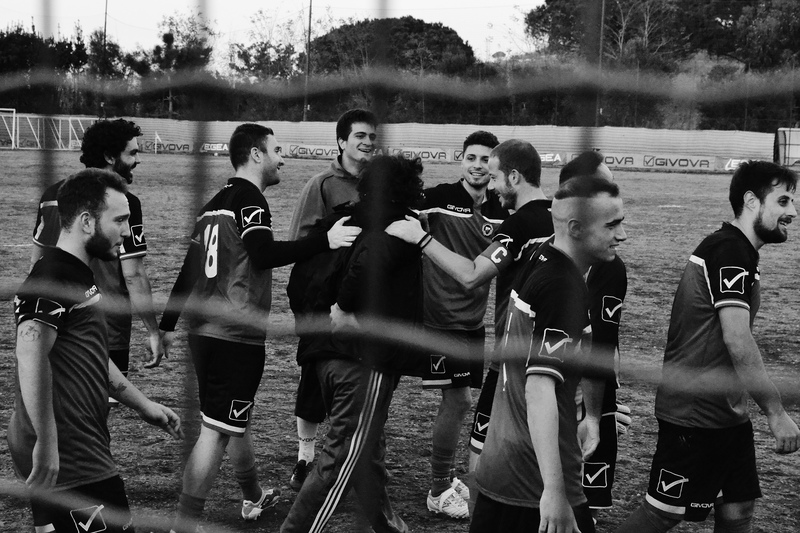 Atletico Diritti, in Rome, is a team composed of refugees, students and prisoners formed to advance citizenship rights and tackle discrimination. The team plays every Sunday. CIAC onlus is an organisation based in Parma that works to promote the inclusion of refugees in Italy. Amongst its main areas of works is: providing legal advice for refugees and working towards inclusion through cultural and sport projects. Their football team – composed of refugees and workers of the NGO – has participated twice in the Fare backed Mondiali Antirazzisti. La Paz Antiracist Football Club is a multicultural football club giving people from all backgrounds and nationalities the opportunity to play football in an anti-discriminatory environment. Liberi Nantes is the first Italian team composed of migrants and asylum seekers. The organisation was founded and has worked with more than 3,000 people, giving them possibilities to play in a team. PlayMore!United is a multicultural team that welcomes refugees, asylum seekers and migrants. The club has two teams one for youth 14-17 years old and other for 18 years old and over. In its first year, over 300 people benefited from the programme. To contact the team go here. This newly formed team is composed of refugees from Nigeria, Gambia, Ivory Coast, Mali, Senegal and Guinea who are resident in the Caramagna camp in the Imperia province (Italy). With the support from Cittadinanza Attiva, the players meet and play together, as well as taking Italian lesson and vocational training. The team meets every Tuesday afternoon for two hours training session from 15.30 to 17.30. The Stella Rossa project was born in 2006 with the idea that sport is a right available to all and as an instrument of combating all forms of discrimination and marginalisation. Stella Rossa 2006’s core values are antifascism, and the rejection of any form of abuse, oppression and limitation of individual and collective freedom. Everyone is welcome. In Potenza, Optì Poba is a voluntary organisation with a legal office that offers assistance to asylum seekers. The majority of the team come from the Horn of Africa in a squad which has more than 50 players in its ranks. The club’s training sessions are open to everyone. 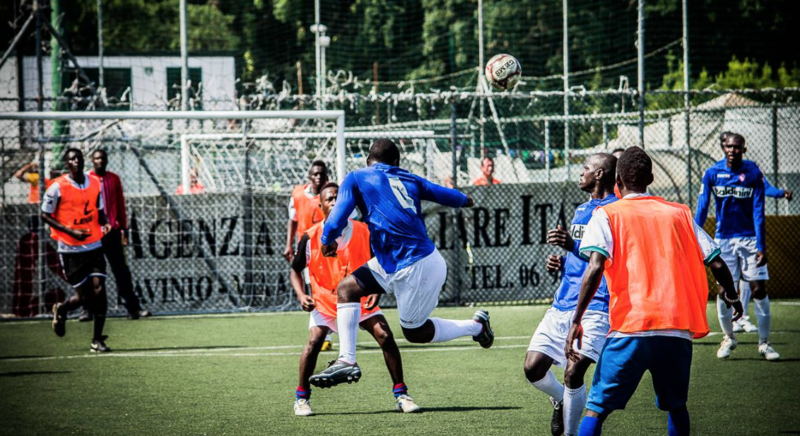 The recently founded football club from Desio consists of refugees and asylum seekers. The team’s motto, which they are displaying on their jerseys, is: “The only race I know is the human race”. On 17 October the team is participating in their first tournament against teams consisting of policemen, journalists and politicians. The teams is open to all people interested in playing football and in fighting against exclusion and discrimination. Furthermore the team is supported by the Italian professional club Internazionale Milan. United FC is a team formed of refugees and asylum seekers sheltered in the provisional centres in Campiglia, Cas di Venturina, Caravella, Piombino and Gavorrano all from the provices of Livorno and Grosseto. The team of 25 players play in the third division of the Livorno championship and have their training sessions in Follonica in Grosseto. US Pozzolese has set up a new team to help integrate refugees and ethnic minority youth. The club opened proceedings with a tournament entitled ‘A kick to racism’, which took place the Pozzolese sport ground with the participation of three other local teams. The new junior squad is made up of Italian, Ghanaian and Senegalese players aged 17 to 20 years old. NGO Sportunity have recently announced the third pillar of its ‘Integration through Sport’ project, which consists of a regular football training for refugee children and teenagers at the Foyer Ettelbrück of Caritas. Trainings will be held weekly n football fields provided by the town of Ettelbrück and FC Etzella. The sports programme also provides for exchanges between young participants at the foyer and the home team, which will enable young asylum seekers to learn languages and better integrate into society. RS Stars, the football team of the Jesuit Refugee Service Malta, has just concluded its first season. The team has achieved a series of positive results in friendly matches played against a number of football teams. Beginning as a small initiative to promote a healthy lifestyle for migrants and integration through sport, the football team now has 47 footballers of different nationalities on its team sheet. The players come from different countries spanning Africa from East to West and meet for training sessions twice a week. Spark 15 are a group of young refugees who have a clear objective: to encourage other young refugees to become active participants and agents of inclusive societies in Malta, and beyond. 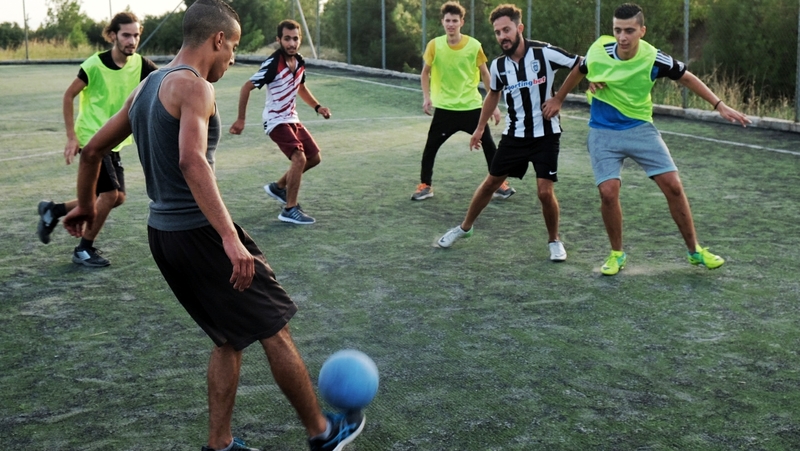 The Malta FA (MFA) launched the ‘Football For Life’ programme to provide football training sessions and games for minority groups, including illegal immigrants & asylum seekers. To ensure success and long-term impact of the programme the MFA have identified activation partners to combine forces with its coaches to design and facilitate suitable activities to each particular marginalised group. In Bussum (30 km southeast of Amsterdam) a group of Syrian players have started to play for Bussumse Football Club. The club has welcomed the idea to integrate refugee and asylum seekers who have been enrolled in programs learning Dutch, training and looking for jobs, but lack social activities and felt excluded. The player first started to train at local sport fields, but now the ‘Syrian All Stars’ can look forward to playing regularly in a football league. FC De Koepel is a refugee amateur club, created by refugees out of the need to promote ways of fostering inclusion and ludic activities. The team’s training sessions are at FC Haarlem Kennemerland ground. For further info go here. Professional club FC Den Bosch host football sessions and evening matches for refugees and disadvantaged people living in the city. Supported by the city council the club offers football and tennis training sessions for more than 150 refugees and is planning to implement gymnastic activities in the near future. Refugees living in the Swietenlaan camp have the opportunity to participate in football training sessions hosted by the football club GRC Groningen. The training sessions are hosted every Wednesday for children and on all other week days of the adults. The sessions are organised in cooperation with the club’s teams to ensure a full integrative experience including language exchanges. The club have kicked-off biweekly training sessions for over 40 refugees living near the club’s facilities. Out of these seven have already made the club’s teams and now play at competitive level. In collaboration with a local asylum seekers centre, PSV provides a weekly football training for adult refugees. The football activities provided keeps them physically active and offer a possibility to forget their troubles for a while and enjoy the fun of the game. The club will soon lunch a new project that involves football training sessions for unaccompanied refugee children aged between 15-17 during the summer holidays. At the end of the holidays, a team will be formed and will train throughout the next season. On 16 November 2015 the club hosted its first training session for 20 refugees living in Haarlem. The then one off initiative grew into a regular training camp for refugees and asylum seekers. The local people in Tilburg are integrating with refugees through this collaborative work between United Through Sport and The Central Organisation for Asylum-seekers (COA). The project aims to give refugees the opportunity to integrate in the local community by taking part in football sessions with the local people. The project was launched in 2016 and is run with the help of volunteers. In Zeewolde the Voetball met Vluchtelingen initiative promotes football training session for 20 children and 10 adult refugees. The initiative was launched in 2015 and is looking to continue expanding in 2016. Zwolsche Boys run training sessions for refugees boys and girls aged between 7 and 17 years old. Amateur club Astor Fotballklubb hold weekly training sessions for refugee youth aged between 15 and 20 n Western Trondheim. The initiative has been running since June 2016. Norwegian third division club FK Donn runs weekly training sessions for refugees. The Football Association of Norway have been re-distributing funding of UEFA HatTrick programme to support nationwide social development programmes that encourage the integration of immigrants. Lyngdal IL‘s Junior 2 team is coached by Ibrahim Najafi who came to Norway when he was 13 from Afghanistan. The team known as G19 2 has welcomed several players who are refugees and asylum seekers, they train every Tuesday and Thursday between 20.30 – 22.00. Norwegian professional football club Vålerenga IF started a campaign to support local refugees in September 2015. Among its activities the club hosts training sessions, donation events and announced they would donate 2,5 Kronen per ticket sold for their matches to refugee projects. 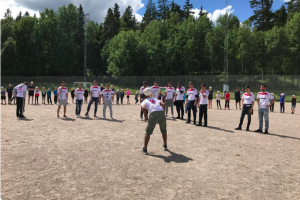 Norwegian club launched a cooperation project with NAV Intro Team and the Volunteer Center in the city Vennesla to enable refugees in the city to play football. The club has also asked their supporters to donate jerseys, football shoes and other material to support the training sessions. Etnoliga is the biggest grassroots integration league in Poland. It welcomes refugees and asylum seekers and currently includes players from Syria, Iraq, Sudan and other countries stricken by war. Fundacja dla Wolnosci, organiser of the league, offers pre-integration sports programmes for adults and kids living in local refugee centres and beyond. For more info please contact via email or call +48502070701. Scottish refugee charity is running regular football training session for refugees and asylum seekers living in Glasgow. The idea behind the initiative is to provide playing opportunities for refugees and asylum seekers, help with their integration and meet members of the community. SAFR is currently looking for volunteers to help run the football training sessions; click here to register as a volunteer. The training session take place at Govan High School every Tuesday 18:30-19:30 female football session and 19:30-20:30 male football session. United Glasgow F.C was formed in 2011 to provide a point of access to regular, structured football for those who might find themselves excluded. The project was kicked-off to help primarily refugees and asylum seeker. Players from all backgrounds, nationalities, religions, genders and all walks of life are welcome. Street Soccer Scotland welcomes asylum seekers and refugees to their free community football sessions in Edinburgh, Glasgow, Dundee and Aberdeen. All their programmes are aimed at socially disadvantaged or isolated players. The organisation runs football matches every Tuesday and train close to the Krnjača refugee camp. The organisation in partnership with the Norwegian Embassy Belgrade and NGO Group 484 organises football training sessions with a professional coach for children over 7 years old. The sessions take place every Monday, Tuesday, Thursday and Friday. The football team Different Colours United is a project of the Institute for intercultural Dialogue, a Slovak non-governmental organisation, launched within the campaign Sport unites – different colours, one game. The team’s motto is: “Diversity makes us stronger“. Hence the team is composed of asylum seekers, Roma football players and players born in Slovakia who all play together as a team and stand together. Different Colours United came into existence with the support from Bratislavská liga v malom futbale (Bratislava´s league of small football) in 2010/2011 as a part of the football project of NGO Ľudia proti rasizmu (People against racism) and Fare. ‘Soul of Africa’ is an amateur football club that unites individuals in promoting and sharing values, such as solidarity, respect, equality, tolerance, fraternity and fighting discrimination utilising sport to eliminate prejudices and stereotypes. Alma de Africa is a team for all where its players are a mix of local Spanish players and refugees from different countries in Africa and South America. The team play in the Third Andaluza Senior Division in Cadiz. The third division club Atlético de Pinto from Madrid offers support for refugees that have settled in the local area. Through the football sessions, that the club offers to the new members of the community, refugees can participate in everyday life activities and take part in what is the most important sport in Spain. The club’s football school will be open to every refugee interested in practicing sports and especially football. This offer coincides with supportive actions of the municipal government in Pinto, the part of Madrid in which the club is based. It is estimated that many thousand refugees will come to the region of Murcia in the near future. About 15,000 are thought to stay permanently in the local area. The supporters of the local football club Cuidad de Murcia have launched a campaign to help the refugees in need and to enable them to participate in sports and especially in football. Supporters are selling Refugioados Bienvenidos (Refugees Welcome) t-shirts for 12 € to cover the costs for a camp and for child support. People interested in buying a shirt are kindly asked to contact the organisers via email. Futsal club ElPozo Murcia run weekly training sessions for youth migrants living in Beniaján. The sessions take place every Wednesday. The Fundación Eusebio Sacristán has several going projects using football to help improve the lives of Valladolid’s most vulnerable, offering them the opportunity to play football and develop their Spanish language skills. The Foundation operates across the Castilla y León region. Valladolid city council and the organisations Red Incola and Accem have kicked-off a sports and inclusion programme, which includes football, swimming, basketball and fitness activities for people at risk of exclusion, including migrants. Askim IK, a Gothenburg-based club, has organised a Welcome Cup to foster the inclusion of refugees and asylum seekers in Sweden. Refugees are also invited to join one of Askim IK teams. Assyriska FF in Södertälje, Sweden was founded in 1974 by Assyrian refugees from the Middle East. Today the club embrace its origins and play an active role in the local communities by organising and visiting summer camps, benefiting children, some with disadvantage social status and backgrounds. The club now play in the third tier of Swedish football, having won promotion along the years. In Skelleftea the Nigerian coach and multiple time African Footballer of the Year Perpetua Nkwocha is running football sessions for refugees and asylum seekers on Tuesday afternoons. The initiative was launched by the amateur club Clemensnas IF in co-operation with the local football association and the Swedish church. 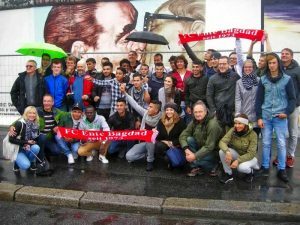 Flyttfågeln FC was founded in 2015 and is made up of young refugees and asylum seekers aged between 15 and 16 years old from the Farsta Centre. The team trains once a week in Farstahallen. The club has started a football programme for refugees and a combined football cultural programme for girls. Trainings take place once a week. IF Positivum is inclusive for all and offers a range of sporting activities including football to refugees and asylum seekers across the Gothenburg area. The Swedish club Malmö FF and the Malmö city council have partnered-up to provide training sessions for refugees. The sessions have been running for two-years and take place once a week to 20-25 participants. Since its start the programme has reached over 200 participants. Gothenburg community group Rampen has created in February 2016 a football team for refugee girls in the city. Over 100 girls have participated in the project and between 20-25 on a weekly basis. Unaccompanied refugee minors in Gothenburg learn about Swedish culture and improve their football skills at Sandarna Team C. Nearly 200 boys are now registered with the team, up from some 30 players when training started in 2013. In collaboration with refugee centres in Flygskytten and Signalisten, Skiljebo SK holds two football sessions per week from 3pm to 4pm for participants of all ages. The Tillsammans or Together Cup is a football tournament that takes place every year on the 6th June across Sweden to celebrate the country’s diversity. The aim behind the project is to bring together local residents with different groups like, refugees and asylum seekers using the power of football. Over 100 people from six different nationalities have joined the multi-cultural football league, which is affiliated with the South Wales Football Association. The league has been set up by the Welsh Football Trust in partnership with Refugee Voice Wales and Sports Wales. The league is reacting to the need for more opportunities for players who play recreational football but have never participated in affiliated football due to financial and other barriers. This league will give those men the opportunity to play regular football in a competitive environment. The team was set up by the charity Unity in Diversity to provide refugees and asylum seekers living in the Swansea area the opportunity to play football. There are two training sessions per week on a Sunday and Wednesday evening. Newport Multicultural Futsal is project of the Fare member Zimbabwe Newport Volunteering Association and offers futsal training sessions every Tuesday for refugees living in Newport. Sessions run from 7.30pm to 9.30pm on the Newport Leisure centre, 1 Kingsway, Newport, Gwent, NP20 1UH. The project currently attracts 50 refugees.